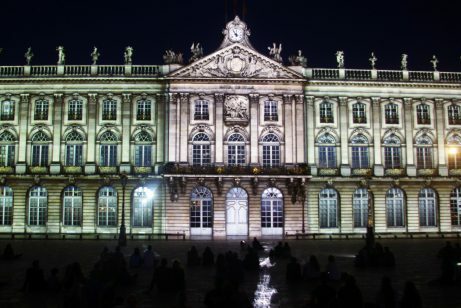 First time in Nancy? Well, you’re in for a treat! 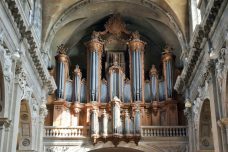 Over your 2 days in Nancy you will discover an array of architecture styles, hearty food and refined gastronomy, rich museums with Renaissance and Art Nouveau collections… After many years I went back to Nancy in June and it still really impressed me. 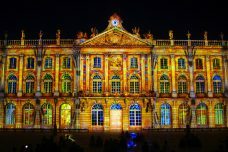 This article will give you some ideas/suggestions on what to visit if you have 2 days in Nancy. 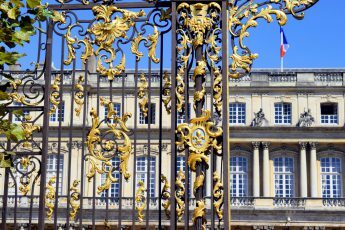 I’ve included those not-to-be-missed sites and landmarks that make Nancy such a great destination 1.5 hrs from Paris. I spent three unforgettable days and took thousands of photos and collected tons of info. I was already thinking about writing this article for you. And I hope it will be a great help! Nancy is a medium sized provincial town. 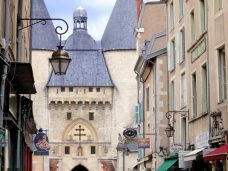 Similar to Rennes, Dijon, Tours or Nîmes. This means that in 2 days you’ll be able to see most of the major places of interest, including two museums. When writing this blog post I’m assuming you would plan your trip similar to me (less one night! ): arriving first thing on day 1 and leaving at the end of the second day. 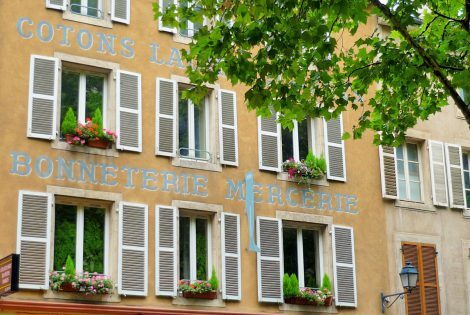 Unlike Paris, it’s pretty easy to figure out how to get around as everything is very close – as long as your hotel is located in the town centre. And that’s my advice for you: choose a comfortable hotel near the historic centre. 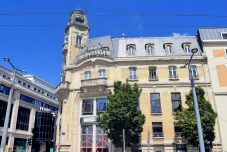 Each time I visited Nancy in the past I choose an Accor brand hotel (Ibis styles, Novotel, Mercure etc). Last June, I tried something different. 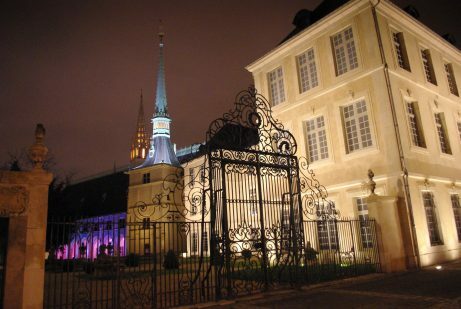 Maison de Myon is a “maison d’hôte“, similar to guest houses in Britain. 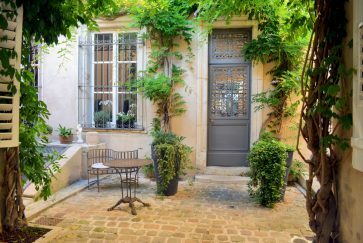 A haven of peace situated just behind the Cathedral in a quiet residential street. 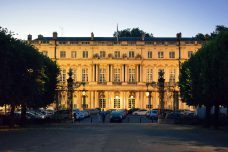 The Maison de Myon is Just a stone’s throw from the Unesco-listed square of Place Stanislas. 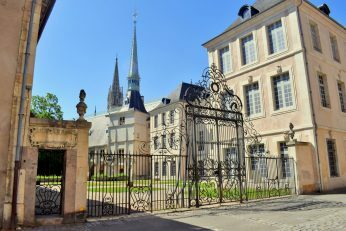 Upon entering the courtyard, I was impressed by such a welcoming, peaceful, and comfortable place, formerly a Canon house (rue Mably and the neighbourhood of the Cathedral were once dedicated to religious activities). 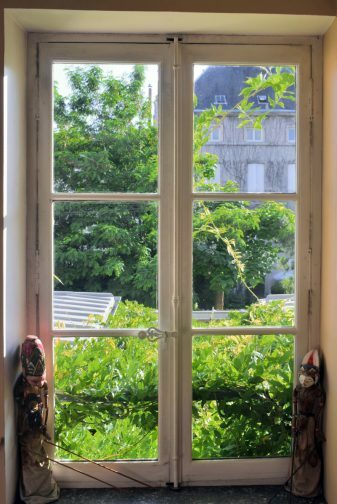 The 18th century mansion was transformed by its owner, Martine Quénot, into a guest house in 2006. 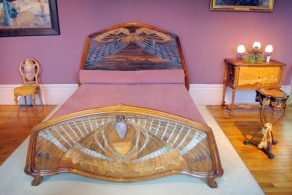 She kept a close eye on furnishing and decorating the property with a high degree of refinement. 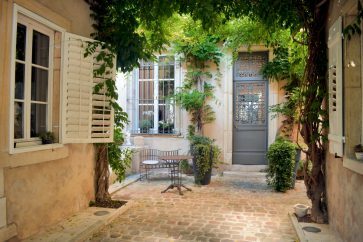 You can book your stay at the Maison de Myon here. By looking at the rooms photos, you’ll understand why I felt so privileged to stay two nights there! 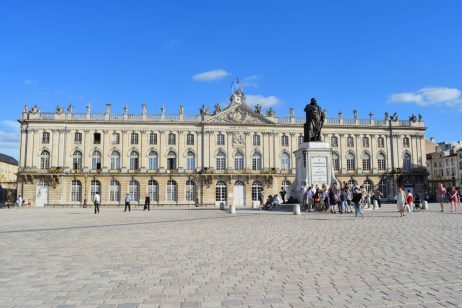 2 Days in Nancy: our suggested itinerary! 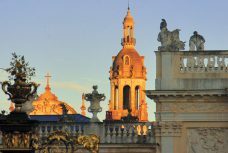 These itineraries will lead you to the 18th century district, the old town and the new town of Duke Charles III. 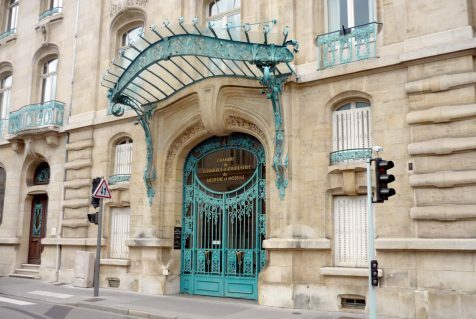 On your discovery of the city you’ll encounter several fine examples of Art Nouveau architecture from the School of Nancy. Day 1. 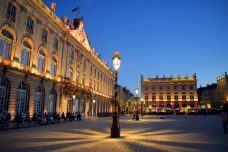 Walking distance: 5kms (6kms including the night outing to Place Stanislas). 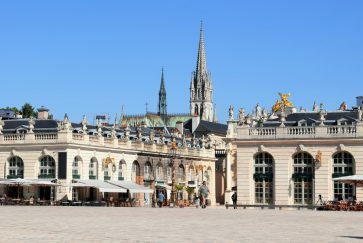 The three Unesco-listed squares of Nancy, the Old Town and the Pépinière Park. Day 2. Walking distance: 5.5kms. 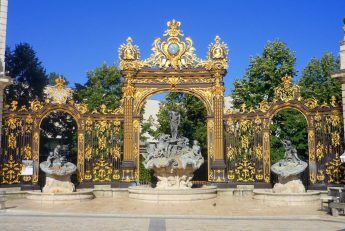 Place Stanislas, New Town of Charles III, Art Nouveau buildings, Museum of the School of Nancy, Sainte-Marie Park. Zoom in on the following map to see the itinerary in more details. 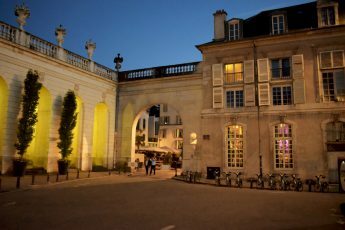 Assuming that you will be arriving in Nancy in the mid-morning, you’ll possibly want to check in to your hotel first. Your room may not be ready before the afternoon. Nevertheless many hotels are happy for you to leave your cases in advance. 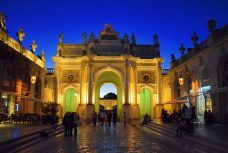 Once outside the hotel, your first destination is the fabulous Place Stanislas. 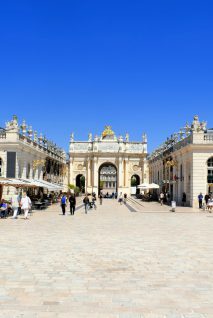 Any visit to Nancy should start with Place Stanislas, the city’s iconic square. Your entrance to the royal square in between the wrought-iron railings will reveal the most famous picture-postcard of Nancy. 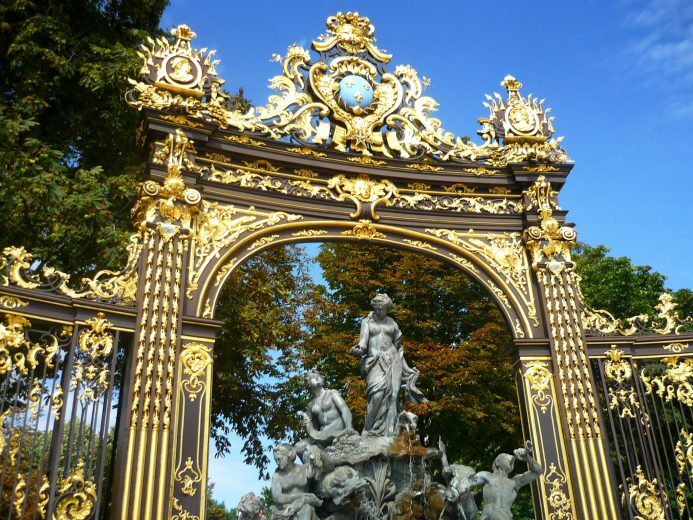 Decorated with gold leaf, the rococo-styled entrance railings gave Nancy its nickname City with golden gates. Well, the inspiration won’t stop there. 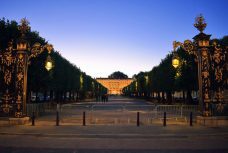 Get to the centre of the square, at the foot of the statue of Stanislas to soak up the atmosphere of this historic place. 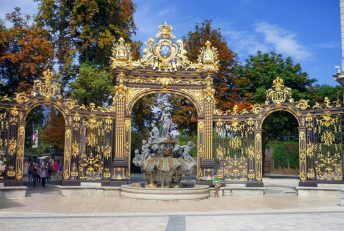 You’ll recognise all the pavillons described in my article dedicated to Place Stanislas. The longest one, to the South, is that of the City-Hall. 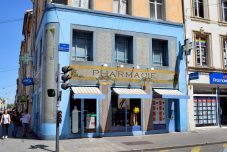 On the right-side you’ll find the Tourist Office which will assist you with any questions you may have about staying in Nancy. You can pick up a useful city-map and a few brochures. 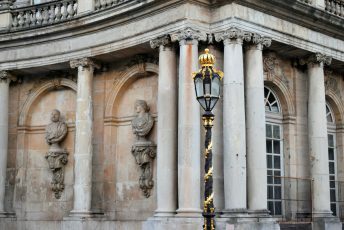 Make sure you admire the two monumental fountains which are framed by rococo-styled porticoes: the Neptune and Amphitrite fountains. 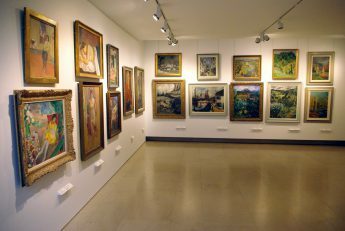 Whilst you are on the square, there is one museum you should see. 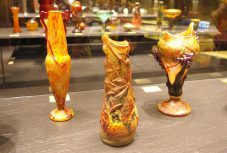 The Fine Arts Museum (Musée des Beaux-Arts de Nancy) has an amazing collection of paintings, sculptures, engravings and crystals. For many visitors the highlight is the Daum collection on display in the underground floor. Make sure you visit the museum before 6pm (closing time) and avoid Tuesdays when it’s closed. 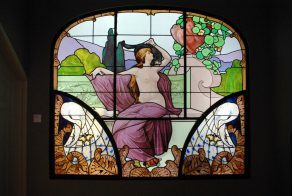 More info about the Fine Arts Museum of Nancy: on the blog – official website. At the end of your visit in the Fine Arts museum it will be lunchtime. 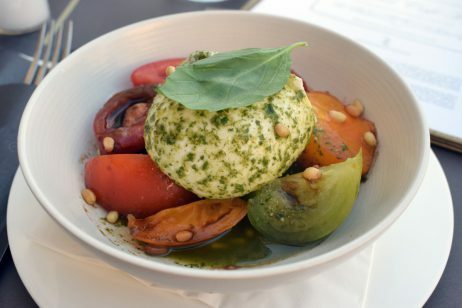 You’re in luck: there is a cluster of restaurants not far away! Can you see the triumphal arch facing the City-Hall? 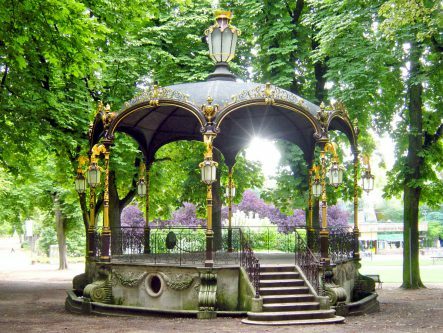 Walk under it and you’ll find yourself in another historic square: Place de la Carrière. Turn left immediately to reach the little Place Vaudémont. 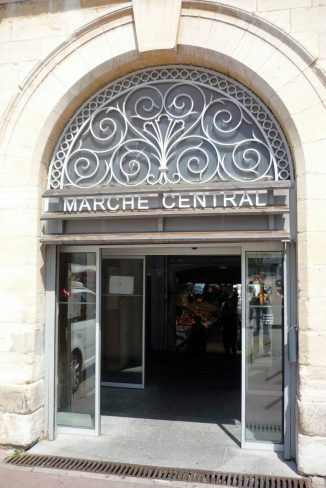 It gives access to the Rue des Maréchaux. 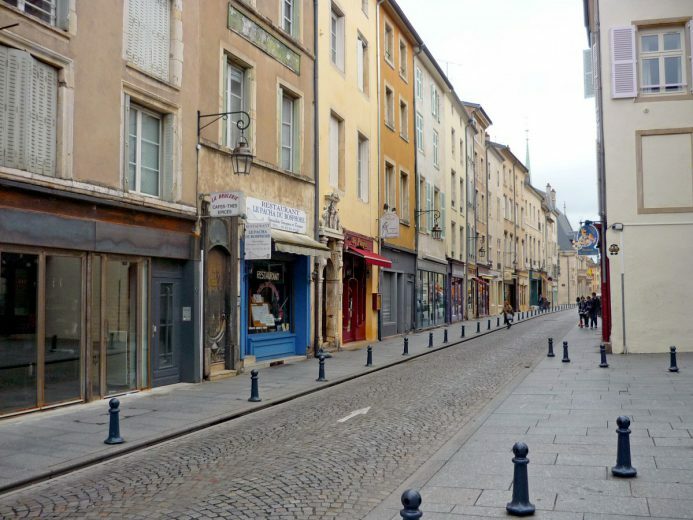 Nicknamed “La rue Gourmande” (Gourmet street), nay-sayers claim that it caters primarily for tourists. 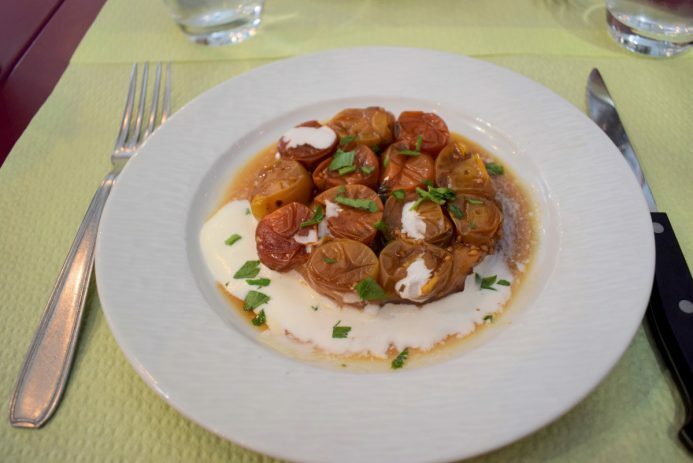 There is at least one restaurant that is a veritable institution in town: La Gentilhommière, 29 rue des Maréchaux. 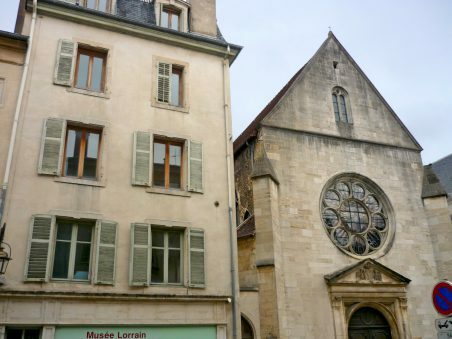 A commemorative plaque on the façade mentions that “here was born on the 15th November 1773 General Joseph Léopold Sigisbert Hugo, father of Victor Hugo”. Yep, the French general was nothing less than the father of writer Victor Hugo, author of the Hunchback of Notre-Dame and Les Misérables. Retrace your steps back to Place de la Carrière. The historic square dates back to the 17th century. The long square was used for cavalry drills, tournaments and jousting. A century later, Stanislas commissioned architect Héré to remodel the square. 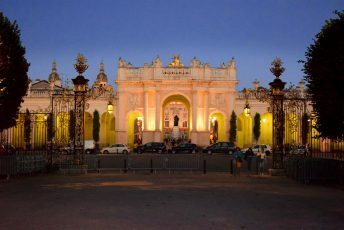 It is now lined with fine 18th century mansions, four rows of linden trees and rococo gates in gilded wrought-iron similar to those in Place Stanislas. 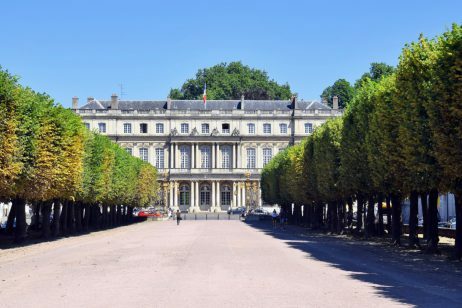 The elongated square leads to the Palais du Gouvernement, of classical architecture. 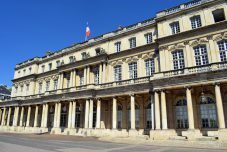 The palace, the residence of the Governor of Lorraine, is linked to the other mansions of the square by an Ionic colonnade. To the right, the colonnade leads to the Place St Epvre. 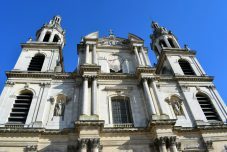 Place St. Epvre is dominated by the bell tower of the St. Epvre basilica. Some people mistake it for Nancy’s cathedral. For the Gothic church is imposing. The actual church was built in the 19th century on the site of a former sanctuary. 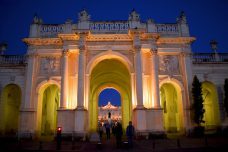 Donators for its construction include famous people such as Napoleon III and the emperor of Austria-Hungary. 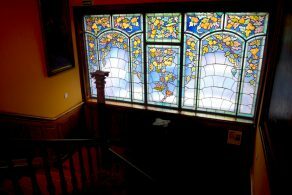 Follow the old streets to discover a few historic mansions, some dating back to the Renaissance era: the Haussonville Mansion, the Wolves Mansion and the Ferraris Mansion. 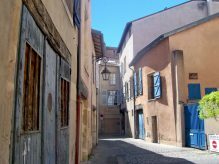 At the end of the Grande Rue (the main street of the old town) stands the fortified gate of Porte de la Craffe. The turreted fortress was built in the 14th century and remodelled several times since. Walk under it to reach another gate: the Citadel Gate. 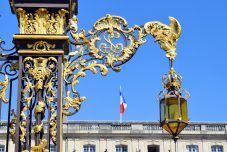 Retrace your steps back to the Craffe Gate and walk through the Grande Rue. 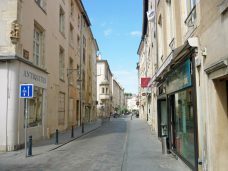 This is the old town’s main street and it stretches from the Porte de la Craffe to the Place de Vaudémont near the Arc Héré. 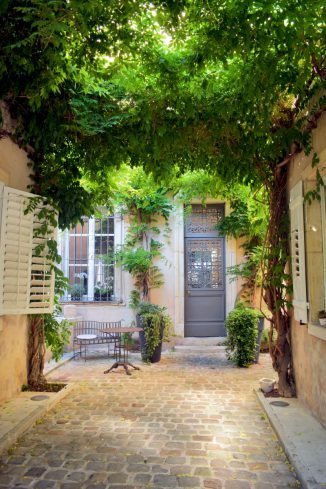 You’ll walk along vintage-looking boutiques and cosy restaurants. 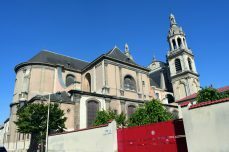 Before arriving at the Ducal Palace, stop off at the Cordeliers Church (15th century). 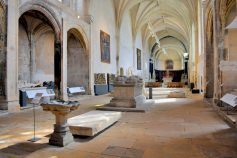 Go inside to discover a historic exhibition on Nancy and the tombs of the Dukes of Lorraine. 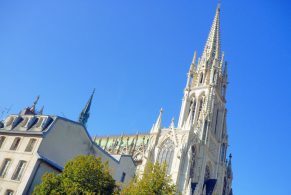 The Cordeliers Church serves as a necropolis for the former monarchs of the independent Duchy of Lorraine. 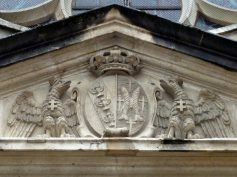 The next monument is the long façade of the Ducal Palace. 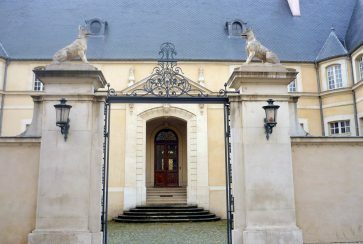 The former residence of the Dukes of Lorraine has been transformed into a museum. 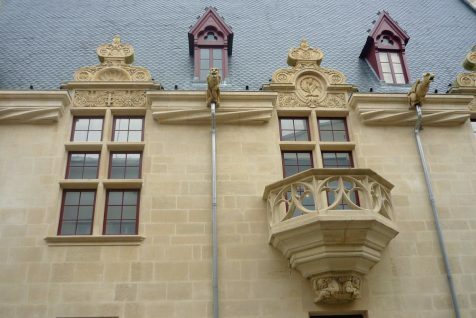 The Musée lorrain is dedicated to the History of Lorraine. 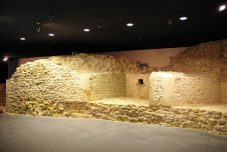 The museum is under renovation until 2023. 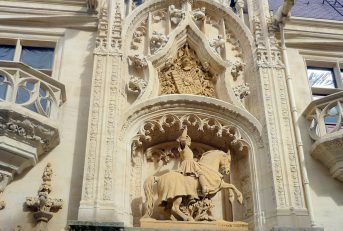 Meanwhile you can admire the majestic grand portal with the equestrian statue of Duke Antoine. Reach the Place Saint-Epvre and cross the hemicycle of the Place de la Carrière to enter to the Pépinière Park. 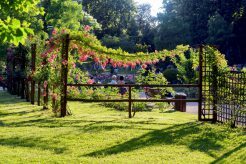 First designed in the 18th century, the vast public park is worth a visit for its rose garden, the lovely Mozart bandstand and, if you’re visiting with children, the small farm. 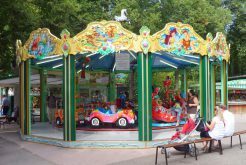 Learn more about the Pépinière Park. 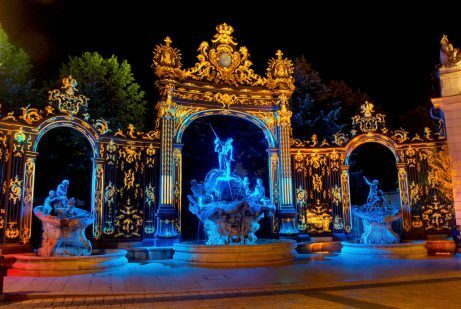 Return to place Stanislas via the fountain of Amphitrite. 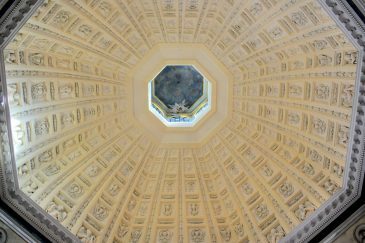 If you still have time before dinner, there are two other major sites from the 18th century to see. 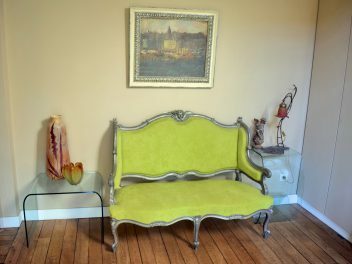 The first is the quiet and peaceful Place d’Alliance. 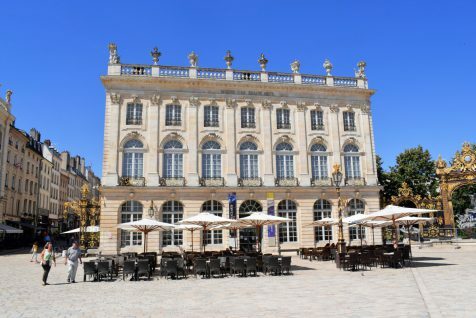 Situated a stone’s throw from Place Stanislas, this isthe smallest of the Unesco-listed squares of Nancy. 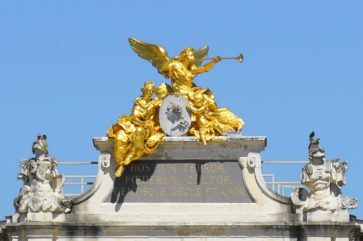 Admire the fountain which is said to be influenced by that in Piazza Navona in Rome. 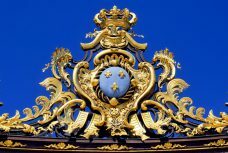 It was created to commemorates the alliance formed in 1756 between France and the House of Lorraine-Habsburg (Austria). 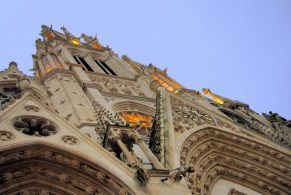 Not far from Place d’Alliance is the cathedral of Nancy. 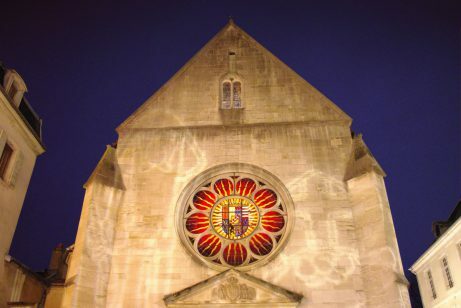 The impressive classical façade of the church was edified in the first half of the 18th century. 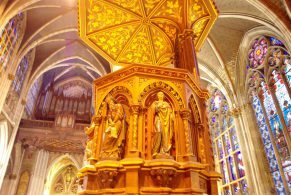 If the church is still open, have a peek inside to see the great organ, the painted cupola and the fine railings of the side-chapels. 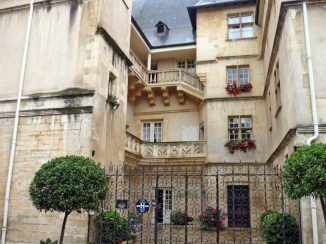 If like me you’re staying at the Maison de Myon, you’ll be just 200 metres away from your room. This is maybe a good time to get refreshed before heading out for dinner. 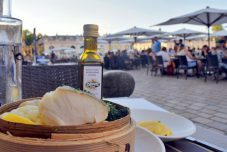 Walk back to the Place Stanislas to indulge in a delicious dinner! 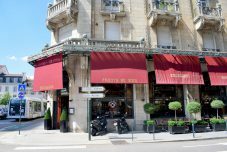 At the end of my first day in Nancy I was invited to dine at Le Grand Café Foy. 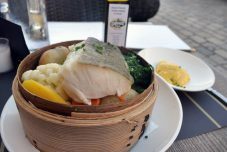 This established restaurant enjoys a perfect location overlooking one of Europe’s most beautiful squares. 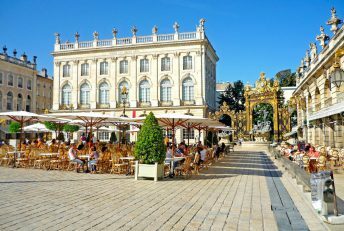 As long as you are visiting Nancy on a fine day, you’ll get to sit at the terrace with a superb view of the surrounding buildings. My dinner there was nice with good sized portions and attentive staff. Afterwards I just had to wait for the night to fall… and then the magic started! 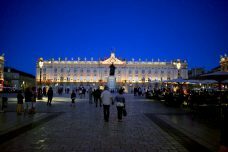 Now I can tell you that initially I had planned to discover the Place Stanislas at night the following day. But I was so excited and curious that I just couldn’t wait. And you might be feeling the same way too. 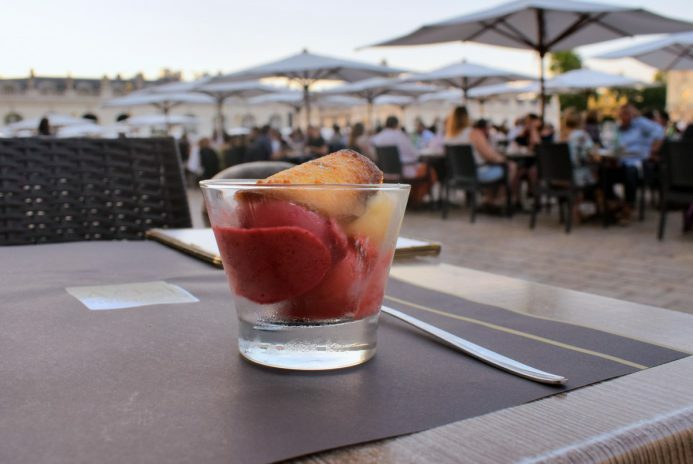 Especially when you sit at the terrace of the Grand Café Foy and see the sun setting and the elegant lampposts begin to light up. 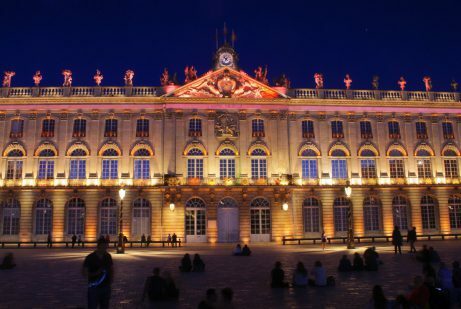 Of course, if you are visiting Nancy in winter this the evening will come much sooner (around 5pm at the earliest). As my trip took place at the end of June, I had to wait until 10.15pm for night fall. 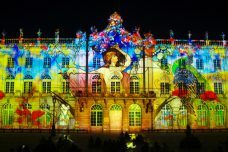 The light show “Rendez-Vous place Stanislas” is the highlight of the night. 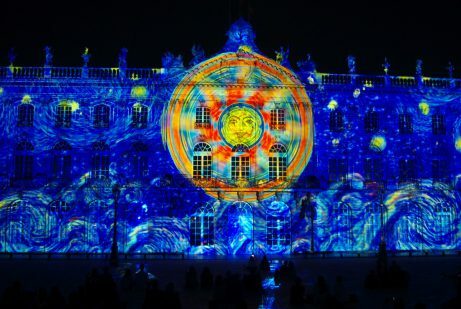 From mid-June to mid-September the show retraces the history of Nancy with an explosion of colours and patterns. 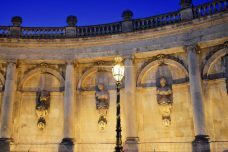 If you’re visiting Nancy in mid-Season, why not attend a performance at the National Opera of Lorraine (entrance on Place Stanislas). More info about the dates and times . If you don’t find the night too long, you could also wander through the old town and the Place de la Carrière. With stars in my eyes I walked back to the Maison de Myon with great expectations with what tomorrow would hold. Zoom in to the following map to see the itinerary in more details. From my hotel, Place Stanislas was only 500m away. I couldn’t resist going back there for the last time. And maybe, like me, you’ll notice some details that you overlooked the day before. 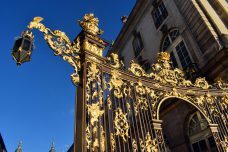 Upon entering the royal square, take a look at the gilded wrought iron gates. 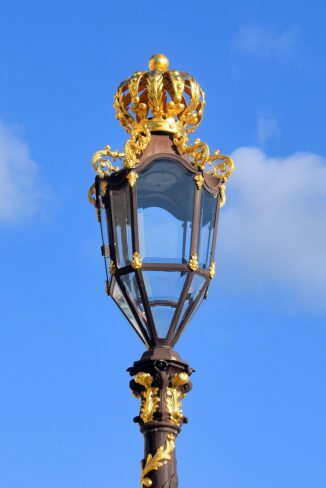 They are entirely covered in gold leaves and display Louis XV’s royal ciphers (a laurel branch, roosters announcing a new day) and symbols of vigilance and France, without forgetting the royal fleurs-de-lis. Now draw closer to the fountains of Neptune and Amphitrite. Have a look at the many details found on these pieces of art. 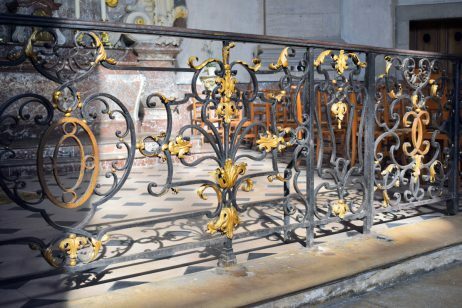 Again you’ll see the ciphers of the King of France: fleurs-de-lis and the crown at the top of the railings. 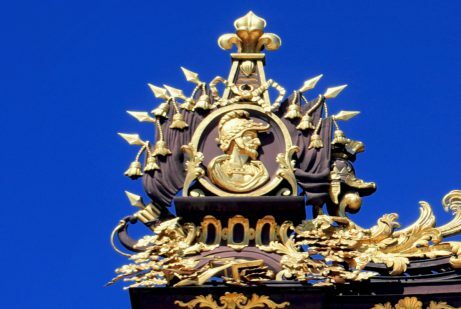 Ten years before the independent Duchy of Lorraine joined France (1766), the square built by Louis XV’s father-in-law was already lavishly decorated to promote the glory of France! If you haven’t been there yet, enter Daum’s flagship store to admire the crystal collections. 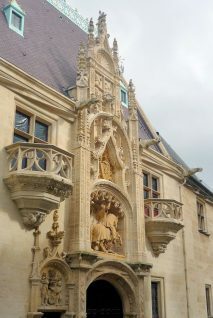 Then make your way to rue des Dominicains (South-West corner of the square by the Tourist Office). Have a last look at the Place Stanislas framed by the two rococo-style railings. 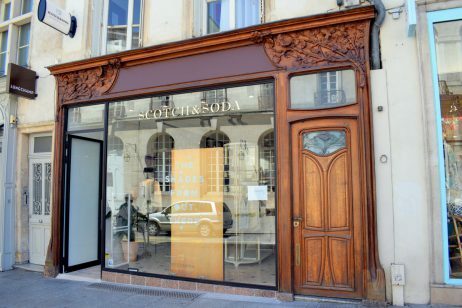 At the corner of Rue des Dominicains with rue Gambetta is the Baccarat store. 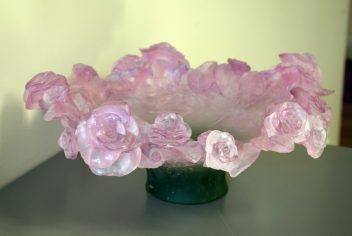 Inside you’ll find exquisite crystal and jewellery… if your purse allows it! Alternatively you can opt for window-shopping! Walk a few metres up Rue Gambetta. At no.21, the Maison des Sœurs Macarons is an old-world confectioner who sells some of the finest almond macarons in all of France. Return the way you came and walk down the busy Rue des Dominicains. You’re entering the vast shopping district of Nancy which extends to rue Saint-Jean and Place Charles III. This part of town is known as the New Town created by Duke Charles III from 1590. 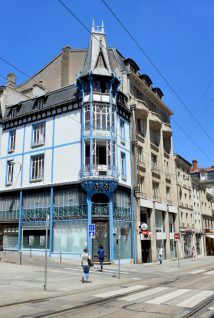 There are a number of fine Art Nouveau commercial buildings to admire: particularly banks, shops and administrations. 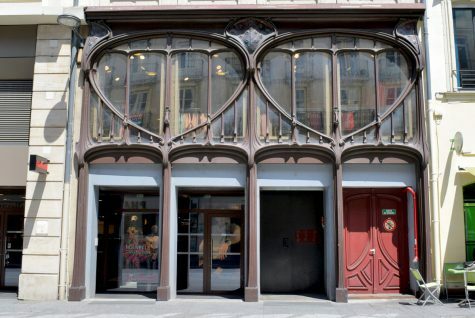 Among all of these Art Nouveau buildings, L’Excelsior is certainly the finest (and the most accessible). 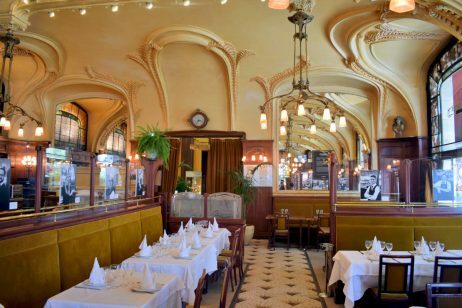 Built in 1910 opposite the train station, the brasserie was designed by Lucien Weissenburger et Alexandre Mienville. Step inside to have a coffee. 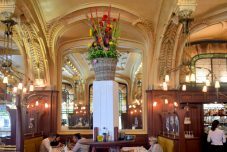 At your leisure admire the opulent decoration by Louis Majorelle (Cuban mahogany furnishings), stained-glass by Grüber, floor mosaics by Pèlerin and chandeliers by Daum. Make your way to the Covered Market. 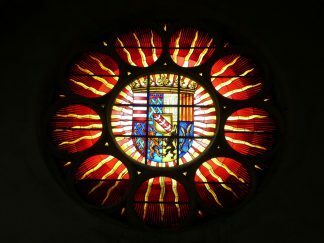 If you have time before lunch, step inside the St Sebastien Church. The Baroque church was built from 1720 to 1731.
a second hand book shop. The market has occupied this site for four centuries. 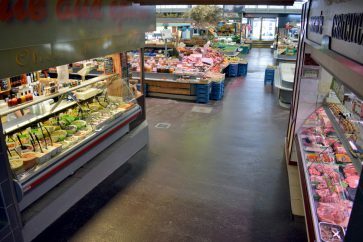 Today it is still a buzzing place and many people come to buy their daily produce and meats. Open 7am-7pm from Tuesday to Saturday. By now it must be lunch time. 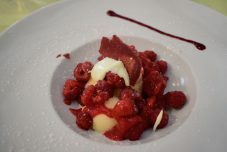 I was invited to a lovely restaurant that is located inside the covered market: L’Impromptu. 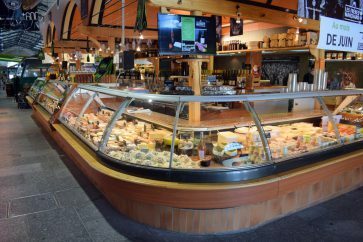 As the name suggests, the cook works ‘impromptu’ from the freshest produce available within the covered market on any given day. 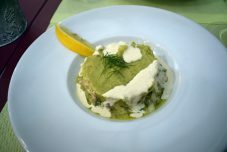 This is your opportunity to enjoy a tasteful Lorraine dish in an unusual yet wonderful atmosphere. 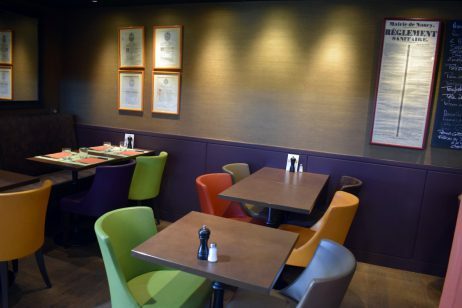 The tables are placed in a bright modern setting under a Florentine canopy or in the cosy lounge corner. 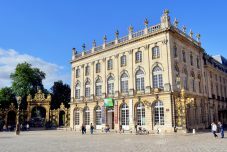 Unless you fancy a 30 minute walk, I recommend catching the bus to go to the Musée de l’Ecole de Nancy. 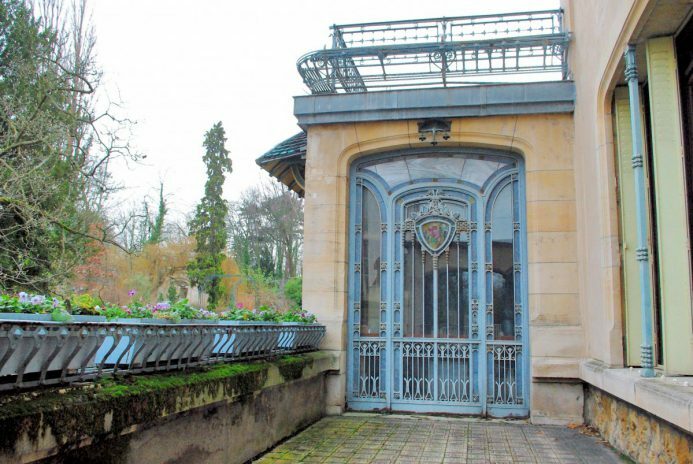 The Art Nouveau museum is situated next to the Parc Sainte-Marie to the South-West of the train station. Take line 7 from bus station Saint-Sébastien and stop at Painlevé. From there walk 200 metres along rue du Sergent Blandan. 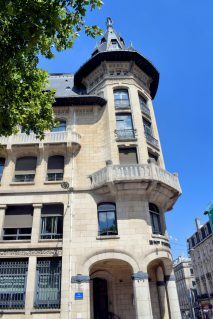 The museum of the School of Nancy is housed in a villa built in 1911-1912 for the Eugène Corbin (founder of the department store chain Les Magasins Réunis). 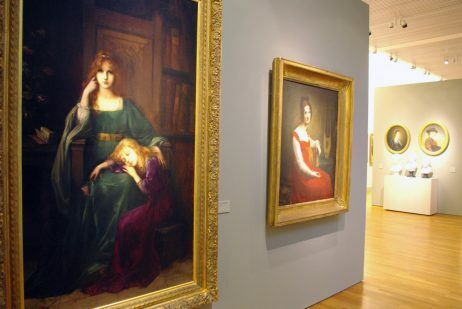 Corbin was also the most important patron and collector of the School of Nancy artwork. 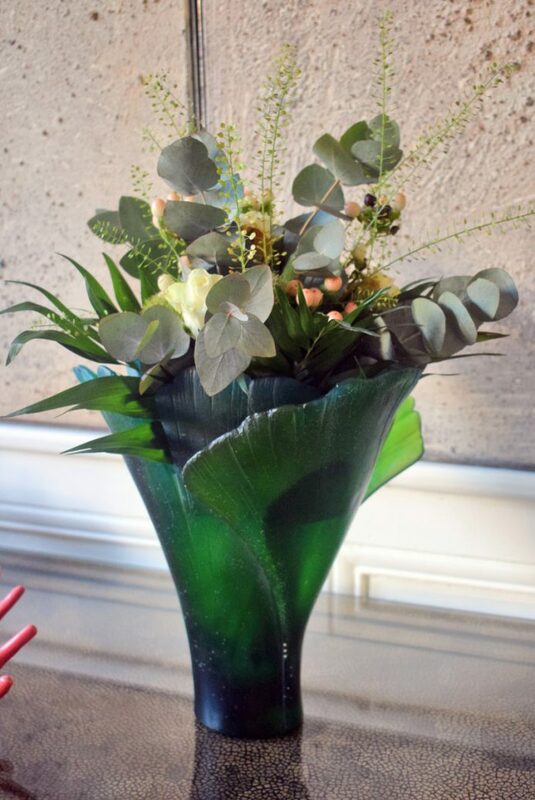 You’ll be amazed by the workmanship of Emille Gallé, Louis Majorelle, Jacques Grüber and Emile André. 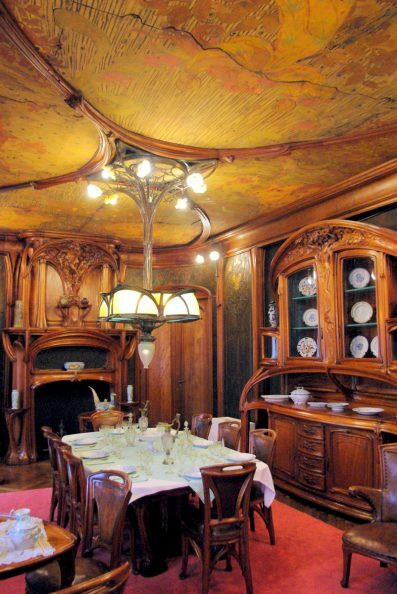 My favourite furnished room in the museum is the fabulous dining room by Eugène Vallin. Check out the museum’s website for more info. Reach the public park of Sainte-Marie via the swimming complex of Nancy-Thermal built in 1913. 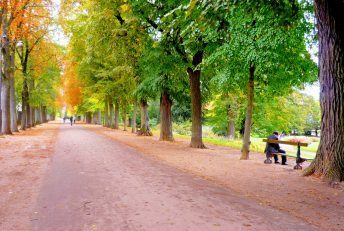 Explore Nancy’s second largest park to find the Alsatian House. The half-timbered house once stood in the village of Zutzendorf, Alsace and was moved in Nancy in 1909 for the International Exhibition of Eastern France. 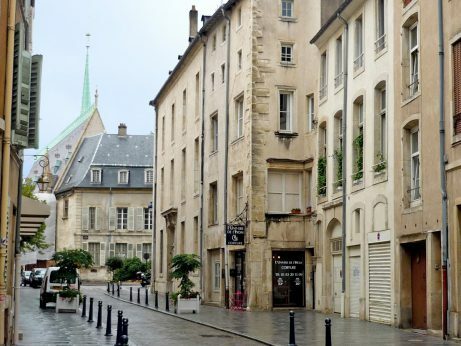 Walk back towards the city centre through the Place de la Croix de Bourgogne. 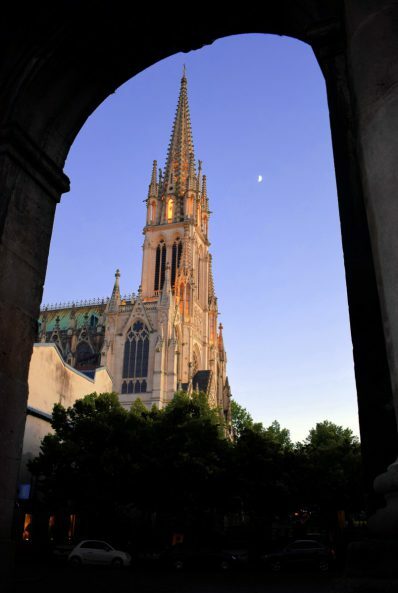 It takes its name from the monumental cross that commemorated the Battle of Nancy in 1477. Until the 19th century a pond (étang Saint-Jean) covered much of the site. 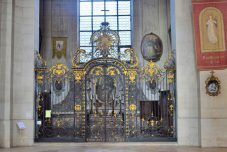 This is where Charles the Bold, Duke of Burgundy, died in 1477 during the Battle of Nancy. The present-day monument was placed on the exact spot where the body of the duke was found. Reach the Viaduc Kennedy from where you can see the controversial high-rise towers built in Nancy’s city centre during the 1970s. The Foch bridge will lead you back to the centre. Unless you need to get your belongings from the hotel, this is now the time to say ‘au revoir Nancy‘. I really hope you’ll spend a wonderful 2 days in Nancy… and that you’ll want to come back to explore more of the Lorraine region! What if you’re staying longer than 2 days in Nancy? 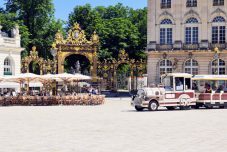 the tourist train of Nancy, a relaxing introduction to Nancy’s famous sights. the Art Nouveau houses in the Saurupt district. the Villa Majorelle, an Art Nouveau masterpiece built in 1901 by Parisian architect Henri Sauvage (the interiors are closed until 2020). 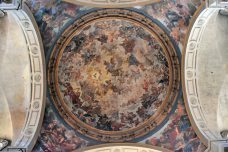 the Baroque church of Notre-Dame-de-Bon-Secours with its richly decorated interior and tomb of Stanislas. 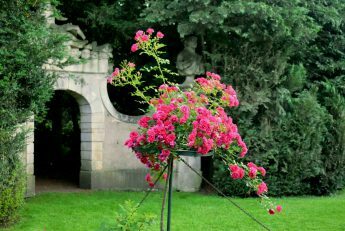 the Botanical Garden of Le Montet. 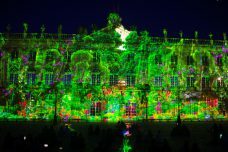 Nancy City-Pass: a great deal for visitors in Nancy! 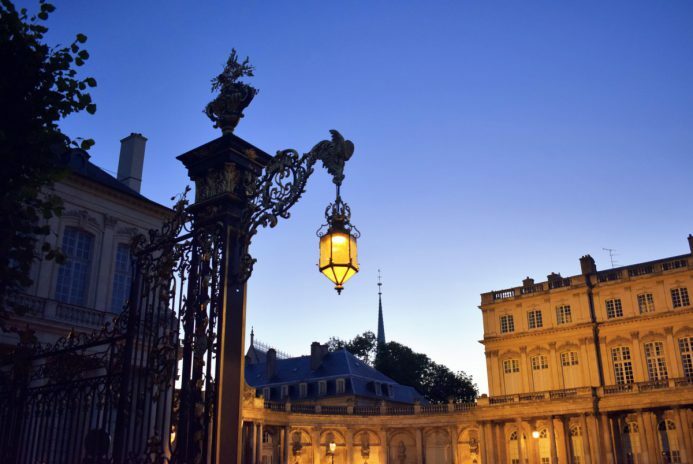 The Nancy City Pass will make you save money during your stay in Nancy. Valid for 1, 2 or 3 consecutive days, the pass allows you to travel by tram and bus anywhere in Nancy + suburbs (STAN metropolitan transport network). Get your pass at the Tourist Office of Nancy, Place Stanislas. More info. Did you like what you read about 2 days in Nancy? If so, please share this article on Facebook or twitter! 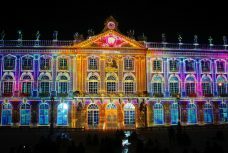 Check out the website of the Tourist Information Centre for more info about staying 2 days in Nancy (or more!). You can book your accommodation via their website: check it out here. Nancy super ville à visiter , j’adore surtout la place Stan !